Toyota Yaris 1.0, 3 door same lady owner last 11 years , £500 spent on last mot 2018 , plus many new parts inc exhaust system 4 new tyres ,battery alternator , serviced regularly but no history mot November 2019 very good condition inside exterior a few small marks . New listingTOYOTA COROLLA 1.6 VVTI T SPIRIT, AUTOMATIC,VERY LOW MILES ONLY 35K,11 SERVICES! 2002 TOYOTA COROLLA 1.6 VVT-I AUTOMATIC. T Spirit (Top of the range). Very LOW mileage only 35,730 Miles. Last serviced at 34,436 miles. Very hard to find these automatics with such low mileage. Apart from a bit of paint fade on the front bumper under the driver side headlight and centre grill (as shown in pic) the Bodywork is in Excellent condition for age. 2008 Toyota Yaris 1.4 D4D Diesel Automatic. Just had a full gearbox service last week at Toyota including full inspection. Electric windows. Electric mirrors. Only covered 43,000 miles from new with Full service history. TOYOTA AYGO 1.0 VVT. FULL MOT RECORD, NO ADVISORIES. 59 PLATE WITH ONLY 43,000 MILES. WELL LOOKED AFTER, DRIVES BEAUTIFUL. TOYOTA AYGO ICE 1.0 PETROL. Here we have for sale a Toyota Aygo 1.0 Move Vvt-i. SERVICE HISTORY. The car has done 40,000 miles which is very low mileage for the year. These cars with low miles fetch around 4-5k. Cam belt done at 14k miles. These cars run to 300k plus miles. 8 months left on the MOT. New tyres. Electric sunroof. black 31000 miles 12 Month AA Warranty No RFL! Toyoya iq2 2012, 32kmiles only, manual. 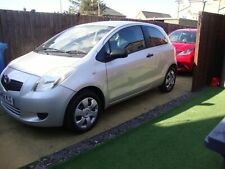 Toyoya iq2 vvti, 2012, only 32k miles, manual. 201 4 TOYOTA AYGO 1.0 VVT-i ACTIVE. IDEAL FIRST CAR. HAS HAD A SLIGHT BUMP FROM BEHIND BUT IS PERFECTLY DRIVABLE AND IN DAILY USE. Fresh Import From Japan, Only 41,000 Miles. Low mileage at 40,000 approx. (changing due to daily use). Very low mileage for age of the car! All parts are cheap and so very low running and maintenance costs. Serviced on average every 10,000 miles. Toyota Aygo 1.0 2013. Excellent Value For money. First to see will buy. Previous pictures are available. Alloy Wheels. The car has a CD Player. Excellent condition. This car was in a little bump at the rear. LOW MILEAGE WITH SERVICE HISTORY. INTERIOR IS VERY CLEAN. SAILS THROUGH MOT. LOOKS AND DRIVES GREAT. BLACK LEATHER STEERING WHEEL. TWO OWNERS, 47,000 MILES, SIX TOYOTA SERVICE STAMPS!! 1.3 Petrol, 5 door Manual gearbox. 2011 Toyota Yaris T-Spirit with Sat Nav & Parking Sensors. 1 lady owner from new with only 36,800 genuine miles. Outstanding car very good condition. 2007 Toyota Auris TR VVT-I in BLUE. Cash on collection. Service history. Bodywork, tyres, alloys all in great condition. 2007 (07) Toyota Yaris 1.3 VVT-i Zinc Finance Available!! 2 REMOTE KEYS. 1 PREVIOUS OWNER. MILEAGE 37,865. 2 KEYS, FULL CHARCOAL GREY WITH BLACK CLOTH INTERIOR, LEATHER MULTI-FUNCTONAL STEERING WHEEL, TOYOTA RADIO/CD WITH AUX INPUT, CLIMATE CONTROL WITH A/C GRAPHITE GREY WITH RED INLAYS, ELECTRIC WINDOWS & DOOR MIRRORS, REAR PRIVACY GLASS, 15" 5 SPOKE ALLOY WHEELS, ** THIS VEHICLE ALSO COMES WITH THE TOW REMOVABLE PACKAGE TO CONNECT TO MOTOR HOME, LOW INSURANCE & CHEAP RUNNING COST, ** IDEAL FIRST CAR ** 6 MONTHS RAC WARRANTY INCLUDED**. City Motoruk Ltd - Call us on 441212721890 or click here to find out more.